NYC: denying the sea and Hansen's sea level predictions | Watts Up With That? Reader John Smith writes in with this interesting photo essay. Back in November 2010 you did a post ( Freaking out about NYC sea level rise is easy to do when you don’t pay attention to history) about sea level rise and its effects on Manhattan Island. 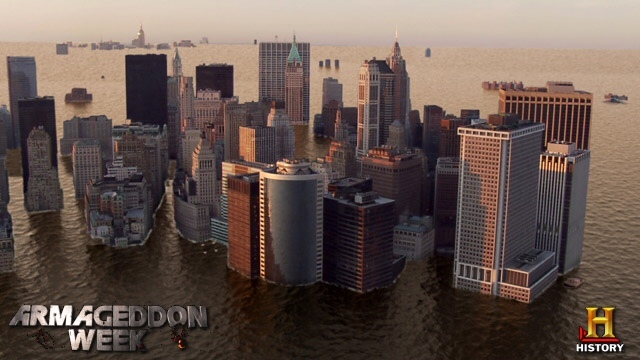 The post started with this picture from an Armageddon Week special on the History Channel, showing what lower Manhattan would supposedly look like after one hundred feet or so of sea level rise. You then included historical information about Manhattan, showing how, despite some sea level rise over the centuries, the dry land of Manhattan Island had actually increased greatly, due to ongoing landfill by the inhabitants. Your readers may be interested to know that the process of landfill in lower Manhattan continues to this day. This has nothing to do with global warming or sea level rise. The latest project, taking place literally in the shadow of the new One World Trade Center, involves construction of a riverside park in the very spot where the debris from the old World Trade Center was loaded onto barges to be shipped away. Lots of new soil is arriving to serve as a home to the plants and trees to follow. 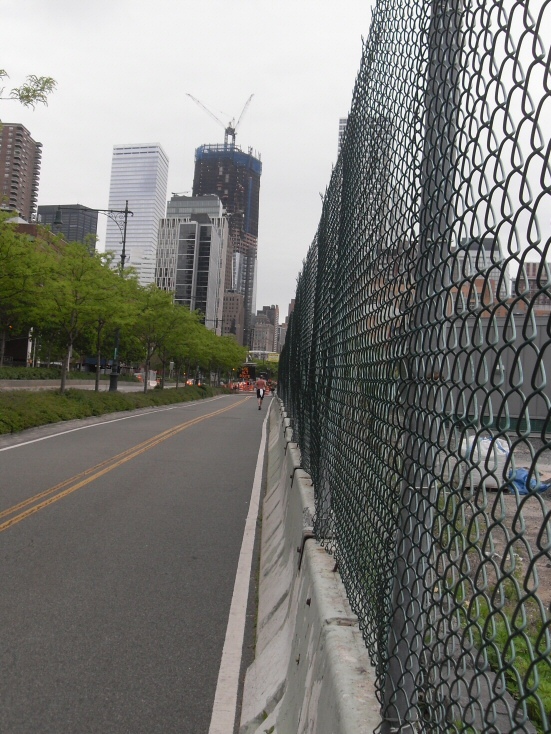 This first picture was taken along the bike path approximately 2500 feet North of the World Trade Center construction site, looking West. The large piles of soil have been trucked in over the last several weeks. Behind the soil is the Hudson River, and the tall buildings in the background are in Jersey City, New Jersey. In this second picture we are looking Southwest from the same spot. 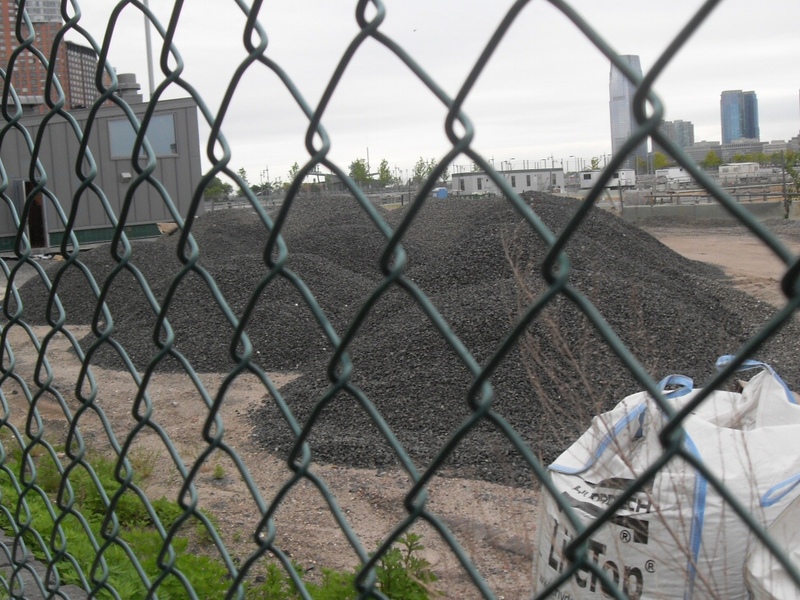 These piles are mostly gravel, presumably for subsoil. The large plastic bags are what the soil arrives in. There looks to be plenty of landfill here to raise the level of the area under construction by at least several inches. Looking due South from the same spot along the bike path, the tall building in the center with cranes on top is the new One World Trade Center under construction. It is currently at about 65 stories, a little over half of its final height. Since the building will be 1776 feet high, and this spot is about 2500 feet away and just West of due North, this spot will be in the shadow of the new building between about 11 AM and 12 AM during much of the colder half of the year. The building immediately next to the One World Trade Center construction is Seven World Trade Center, also visible at the upper left of your History Channel picture. 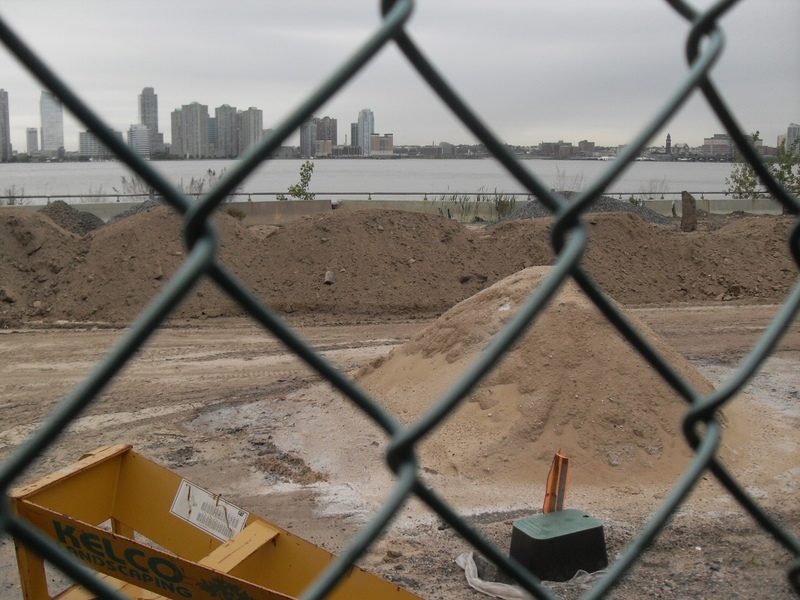 Finally, another part of the construction project involves raising the sea wall that forms the shore line of Manhattan. As far as I can tell, this part of the project has nothing to do with protecting Manhattan against sea level rise, but rather is an esthetic matter to make the sea wall in the Tribeca segment of the park transition smoothly to the sea wall surrounding the Battery Park City neighborhood immediately to its South. 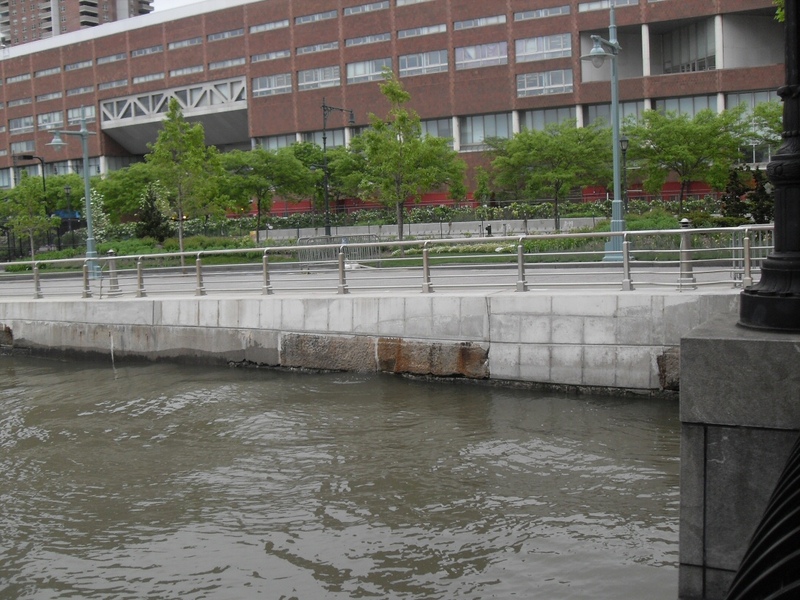 The Battery Park City wall had been built several feet higher, so previously there was a large step up where one ended and the other began. This last picture is taken from the North side of Battery Park City (less than 1500 feet from One World Trade Center), looking East back to the sea wall of the island just North of Battery Park City. This is actually the spot where the debris from the old WTC was loaded onto barges some nine and a half years ago. The lower, dark portion of the wall pre-existed, and the upper, white portion was built approximately one to two years ago. This should provide plenty of protection against any potential sea level rise for the next century or two! I’ve added this Google Earth map to help readers locate the place – Jim Hansen’s office is further North near the West Side Highway. Click image to enlarge. Oh, Dr. Hansen! I hope some enterprising judge lists all of his failed predictions before tossing his glurge lawsuit out of court. Interesting post. But it shouldn’t be used to go down the slippery slope of conceding that much, if any sealevel rise is a sure thing. The region is still rising from isostatic rebound following the Wisconsin Glacial advance. We have repeatedly heard about such sea level rises in Hawaii. All the while the sea levels have remained more constant than they have in millenia. You can simply go to pilings, etc. and view the evidence. We have issues with erosion, etc. But that is primarily caused by man made interference. Actual measure of sea level seems to indicate that Maui and the Island of Hawaii are s l o w l y sinking while the smaller islands are rising. It is attributable to mass. Hawaii has reef residue etc. more than 200′ above current sea level. Albeit placed a while ago. Now that is scary. And it has not nothing to do with CO2 levels that anyone can ascertain. I thought the Stern Report said that people could only sit there and be drowned? That new wall looks more proportional, and nicer. If it helps calm the nerves of risophobes – or whatever people living in fear of sea level rise are called – and its in a new construction area, why not? Great to see that new WTC going up. Nothing in “climate science” appears to be a sure thing — except lots of strange science and weird analysis from both sides. But there is 120+ years of tidal gauge data backed up by 20 years of satellite measurement that says that sea level has been rising at about 20 cm (8 inches) per century since 1880 or so (and probably before). 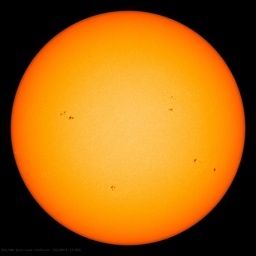 The satellite data shows a bit higher rate — 30 cm per century (a foot). A reasonable person might — and I emphasize might — choose to use the satellite rate despite the rather short timespan. Satellites have better coverage. Even the folks at Alarmist Central (the IPCC) could only conjure up a maximum of 48cm (19 inches) in the 21st century in AR4. I personally have concluded over time that IPCC projections are similar to China’s notoriously bizarre economic statistics — dubious analysis of iffy data to obtain quite likely biased results. Note that the IPCC manages to find an increase in rate of sea level rise around 1940 that is missing from the Wikipedia chart. I can’t think of a single reason to prefer IPCC data to data from any other remotely credible source. You are possibly aware, the Hawaiian Islands are the highest points in a chain of volcanos (the Emperor Seamounts) that stretches from slightly SE of the island of Hawaii to the Aleutian trench. What we’re pretty sure is going on is that there is a hotspot volcano currently located under the island of Hawaii and the Lo’ihi seamount. As the Pacific Plate moves NW, volcanic islands are built over the SE end of the chain. As the islands move NW, their source of lava is eventually cut off and the islands then both erode and sink until they eventually no longer make it to the surface. I believe that the most Westerly island that still has some lava above sea level is French Frigate Shoal about half way between Oahu and Midway. The most westerly island of any sort is Kure atoll. So, overall, the Hawaiian islands other than possibly Hawaii are probably all sinking very slowly. Some of those have been reinterpreted as tsunami debris. Not sure that some of them might not be legitimate reminders of higher sea levels in the relatively recent geologic past (when? Surely, no more than a few million years?). And no, the evidence does not seem to me to implicate CO2 as the primary agent in sea level rise and fall. I could easily be wrong. But so could the climate scientists. Or — and I think this most likely — we could both be wrong. AR4 Table SPM 1 (once they corrected the incorrect figures originally published), rate of sea-level rise between 1961 & 1993, 1.8mm/yr +- 0.5mm/yr. Between 1993 & 2003 3.2mm/yr +-0.7mm/yr. Nils-Axel-Morner reckons average global sea level rise for last century was 2.3mm/yr. 1.8mm + 0.5mm = 2.3mm/yr, 3.2mm – 0.7mm =2.4mm/yr. Call me mister picky but to all intents & purposes these numbers are identical, & who’s worried about a 1/10th of a millimeter increase in sea-level rise? As reported in March on WUWT a new paper showed decelerations in the rate of sea level rise around the US coastline. 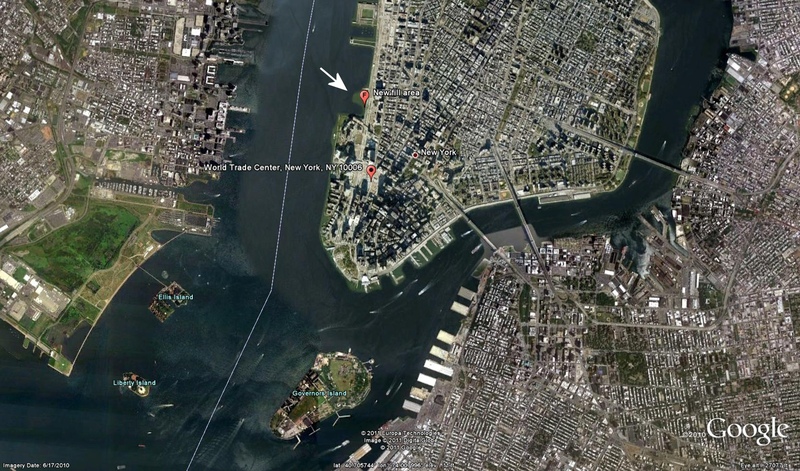 Just 17 years to go before the Hudson River overflows into the streets of denying NYC. Where will Hansen be in 17 years time? Sea levels were lower during past ice ages, as we all know, and they were also higher in times past. During the Cretaceous sea levels were much higher and flooded the central states of the US. (Proof- look at the Book Cliffs in Colorado and Utah. Cretaceous coals in Utah, mined at Kenilworth and shipped out on mile+ long trains from Helper with up to eight big diesel engines up the long steep track to the west). Reasons for this rapid, geologically, and extreme rise lies in a speeding up of the tectonic plate system resulting in a shallowing of ocean depths. Certainly not climate change. I’m just waiting for the AGW study that suggests blowing up the moon to stop sea level rise. I recently made a stunning discovery that involves no new original research, but merely observation of official tide gauge data in a wonderful archive that I found listed on the Real Climate data sources page: the vast majority of long-running (century old) single site sea level records show no trend change whatsoever in the modern era, and unlike thermometer records they are not very noisy on the decadal scale, so a historical pre-emissions-boost trend can readily be seen after only one instead of two or three centuries. The site plots them and offers a Google map of nearby records too (if you zoom out a bit). Logic dictates that claims of suddenly surging global sea level, more than predicted, should certainly show up at least a bit in a large percentage of single site records but it does not! There are dozens of century old records too, whereas the required multiple century long thermometer records only exist is a single dozen or so sites, and only in the US and Europe, all large cities. I find it hard to believe that this simple argument doesn’t feature prominently in this great debate. Searching through the archive at http://www.psmsl.org/ gives me that old feeling that I felt when I first started to become skeptical about three years ago of “my god they are just lying”. The longest records take hours to find on there though, so that’s what I recently did. Many show steady decline but very few overall show even a hint of a recent upswing away from a linear trend. Is my logic somehow flawed? So far after a week of posting my graphic far and wide the only “criticism” I’ve received is that I’m just spouting “denialist talking points” that have been debunked long ago. That, and just pure vitriol. Or I’m accused if cherry picking by those unwilling to have a look for themselves. Real arguments are not offered since thus claim is not covered on their favorite AGW enthusiast sites. If a more database savvy soul could send me a list of these sites in order of length of record, I’d appreciate it since the index only lists end dates (NikFromNYC@yahoo.com). It took me six hours to browse manually all those that carried past 2003 instead of ended before that and I didn’t bookmark them all, regretably. It might be fun to make a video of all the old ones. There are also three very old (back to the 1700s) records listed under “other long records” but the data offered ends long ago too and I haven’t had time to try to extend them. It is instructive to read Chapter 5 of AR4 and especially the graphs and the stuff that comes after the references. In essence made up (sorry interpolated) tide gauge data from a century ago is spliced onto modern tide gauge material then spliced onto satellite records. There are only seven ‘historic’ tide gauge sites in the world that haven’t moved and many of those have had construction going on around them. In that respect the tide gauge record as used in Ar4 gives a very misleading view of what is going on with its artificial up tick and its precise measurements. I do not know if anyone has ever refuted this claim which appears to be a call for a worldwide emergency effort before it is all too late. The Climategate scandal may well have “unsettled” the science on this issue and robbed this clarion call of much of its force. The UN sitting right on the East River has been doing a $2Billion renovation project for the past 3 years to be completed in 2012. Why aren’t they running for higher ground? Yes, but … it was a different North America in the Cretaceous. For starters, there were no Rocky Mountains and the central lowlands very likely extended all the way to the Sierra Nevada — which may or may not have resembled the modern Sierra Nevada. The Appalachians were possibly a bit higher as they have probably eroded a bit (It’s not easy to explain why they are still around). I don’t think one can meaningfully compare sea levels then and now although the consensus is that there was very little permanent ice back then so sea levels were probably pretty high. change is fundamentally ﬂawed.” I wouldn’t rule out the latter option entirely. Alexandria (Egypt) have been a major port for 2000+ years, without any obvious damages due to rising sea levels. No obvious damage? Cleopatra’s palace at Alexandria is ~20 feet below the sea! I find it hard to believe with tides (and variable moon and Sun distances), wind changes, currents, water temperature changes and other factors, 1 mm of sea rise or fall could even be measured. Not on topic, but as Don K was wondering why the Appalachian Mountains were still around, I thought I’d jump in as these are “my” mountains that I studied quite a bit for my degree in geology. The Appies are formed from folded sedimentary rock layers, the result of the collision of Africa and North America, causing the mountain-building episode named the Appalachian Orogeny, which lasted from the late Silurian to the late Permian (approx 420-250 MY ago). They were awfully big mountains when it was all over — perhaps larger than today’s Himalayas. They were also formed from some very tough sandstones and limestones, which in regions close to the collision line were metamorphosed into even tougher rocks. Granitic mountain chains will no doubt last even longer — but the nearly unimaginable time scales of geology is one of the reasons you don’t see many geologists on the CAGW bandwagon: we know how long these processes have been running, and how they ebb and flow over the ages. Which seven are these? The lack of big kinks in in the vast majority of long records is what surprised me the most, actually, so I don’t see a lot of evidence of wildly misbehaving site maintenance in the results, like I do very much see in randomly sampled thermometer records, but oddly enough not in the very oldest ones of those either. The region is rising as you say, but the effect on the NYC area is that the land is dipping further into the sea. The regional plate is tipping about an axis that is inland. As a result, the measured sea level in NYC has been rising for centuries, long after the tremendous rise caused by the melt-water of the ice sheet was complete. The rate is close to 1-foot per century, and is documented in articles by Leatherman. Gornitz, an avid champion of the Hansen/GISS view, acknowledges this in her calculations and projections of sea level rise by AGW for the NYC region. Here is an extract from my sea level study-although its out of context and not yet edited I think it gives enough information to answer some of your questions. Its really what has been done in Chapter 5 of AR$ to splice all sorts of records of varying provenance together that concerns me as they are trying to parse inaccurate or incomplete records to fractions. “The trouble is that organisations- such as the IPCC- exclude natural cycles and draw straight lines from a recent start point. The level of knowledge of past sea levels by those in the industry-let alone the general public- is very poor. Generally speaking those involved are merely looking at satellite records and don’t delve any further back. The general public just believe what the IPCC and MSM tell them. The reconstruction by IPCC using 23 tide gauges from 1900 -only 2 from the SH- and which include only seven that haven’t moved -but ALL of those subject to considerable development around them-is a very poor piece of work. The latest existed only from 1933. A couple predate 1900. To then stick inaccurate (in their own words) satellite altimetry on top and try to pass it off as a highly accurate measure of the recent past is nonsensical. Ironically even Wiki are equivocal on the subject of its accuracy! This is the Newlyn (UK) tide gauge details from which all sea levels are referenced Readings were taken over a 5 year period from measurements on a staff. I’m assuming it’s based on averages, but if so, what is the margin of error in these measurements? And I know our satellite technology is pretty good, but good enough to measure that 1mm difference? Not quite. Remember that hot crust is more buoyant than cool. As the Emporer chain conveys the islands off the hot spot, they cool, and sink…becoming smaller as the sea and settling decomposes the labile basalt which composes the islands. At some point along the way the north coasts of Oahu and Molokai fell into the abyss (you can see the landslide scar on Google Earth), likely causing an immense tsunami. The contention that displaced corals are tsunami-emplaced is perfectly valid as is the progression from volcano to guyot. In fact, isostasy and tectonics can account for many sea level variances worldwide. Manhattan is still getting over being mashed by the continental glaciers. True, and the old jetties as well. I believe the old library is also below water. Very little of that is due to sea level rise, but instead there was a major earthquake that sank all of that in a matter of minutes. I have forgotten the date of that cataclysmic event, but it should be easy to search on the web. Ok I looked it up. 335AD was the earthquake that dropped Cleopatra’s palace under 20 feet of water. For the purposes of this discussion the most relevant portion is this quote. Generally speaking OSTM/Jason-2 has been specified based on the Jason-1 state of the art,including improvements in payload technology, data processing and algorithms or ancillary data (e.g: precise orbit determination and meteorological model accuracy). The sea-surface height shall be provided with a globally averaged RMS accuracy of 3.4 cm (1 sigma), or better, assuming 1 second averages. If you go to the PDF there is a table which follows this section that lists the elements of the error budget. I would call your attention to the line for significant wave height which indicates they are unable to distinguish wave surfaces to closer than 0.5 METERS. Since waves are present over most of the oceans most of the time I’m still puzzled how even their claims of centimeter accuracy can be more than a statistical fantasy. It is nevertheless a fascinating document and if you’re interested in this area at all I highly recommend spending some time exploring it. If you are at all like me you will find yourself drifting between amusement and irritation at how many seemingly intelligent people are still willing to argue about millimeter and tenths of millimeter variations in GMSL. Owen, you stole my comment before I had a chance to write it. Yes, an earthquake in 335 AD destroyed Cleopatra’s palace, part of the Library, and caused part of the coast to sink over 20′. Many statues from the palace have been recovered, but archeological work is very dangerous; becouse of the erthquake many palace columns are unbalanced at the bottom of the bay. Also, size of these columns is something worth seeing – they are huge. I have no time to check now, but if I remember it right, there are few ruined Mediterranean port cities, destroyed by an earthquake, where ground did not sink, but was elevated instead, and those ruined port cities are now about 3 miles away from the coast – I would love to see an alarmist trying to explain sea level rise by using those port cities as an example. I think your Potsdam fellow has it backwards. At the end of a glacial event the lower latitude and lower elevation ice will melt initially. Once the melting of this ice proceeds and leaves only high latitude and high elevation ice there isn’t going to be a time of “really gets going” and “unstoppable” melting of ice. Visit Seattle – look at “the Mountain.” Mt. Rainier still has glaciers while the massive Puget Lobe of the Frasier Glaciation is long gone. The Laramide Revolution was well under way (the Rockies were forming), and the central seaway in the US was shrinking drastically in the latter part of the Cretaceous. Also, the Early to Mid-Cretaceous featured high rates of sea-floor spreading (NA and SA speeding away from Africa) but that was slowing down (and the greatly enhanced spreading ridges were diminishing as they cooled and sank back into the asthenosphere), so water was receding back into the ocean basins. Most of the Earth’s land mass was in temperate climates. There might have been some floating ice at the North and South Poles, but it would be a fraction of the amount that obtains today, mainly because a giant mountain called Antarctica sits squarely on the South Pole and allows for a massive buildup of ice on its very cold highlands. So, a scan of that Rutgers paper suggests that their “backstripping” model is wrong, and that the rather smaller estimates of rising seas from European studies is correct. They’re seeing the water driven from the central North American epeiric sea by the uplifting Rocky Mountains, lessened somewhat by an expanding (deepening) ocean basin. The Cretaceous was pretty hot throughout*, so how could its nascent, floating ice caps have much to do with anything. Cripes, there were dinosaurs and forests in the highest latitude parts of Canada, at least, in that time. I’ll have to read that article carefully, but it looks like reasonable field geology gone bad through the use of some “model” calculating a number of difficult to estimate variables, and a complete oversight of the global conditions that pertained in the Late K. And, all the figures in the pdf are upside down! *The Cretaceous, and most of the rest of history back to about 600 MYBP, was considerably hotter than today, and the atmosphere contained as much as twenty times more CO2 than today, and yet no “runaway” global heating took place. And further, based on the rate of increase of species (and their rapid return after a couple or three catastrophes scattered through those 600 million years that nearly extinguished life each time), life seems to appreciate conditions like Southern Florida or Brazil, and grows like topsy. I don’t, but it seems I am vastly overruled. I’ll just hang out where its mostly 70F. I believe that he was referring to a sea level rise caused by arctic and antarctic grounded ice melting as a result of their projected anthropogenic temperature increases in those regions. He may be the German equivalent of Dr. Michael Mann or Dr. Phil Jones. You are probably correct regarding glacial events. I was not familiar, and thank you! Looks like sea levels are plunging. Must be problems with multiple altimeters. Just for reference, the primary reason that I have referred to Dr. Rahmstorf is that he, as a person proclaimed by the news media to be a leading world expert on sea level changes, provides ‘top cover’ for sea level disaster scenarios like those presented by the History Channel and effectively insulates them from charges of unwarranted alarmism and sensationalism even if the current evidence seems to indicate that the rate of sea level rise appears to have slowed down. I note that he is now listed as a vice chair of the IPCC. My personal view is that sea level and ice-pack changes are probably being driven primarily by natural processes.